2: The record crowd at the ground game on 18th February 1928 when 47,298 turned out for the FA Cup 5th Round tie. 3: That 47,298 capacity was as big as the ground ever expanded. However, safety measures down the years, especially after the Hillsborough Disaster meant that the ground had a 22,000 capacity upon closure. 4: Filbert Street got floodlights in 1957 with the first game under them being a friendly against German side Borussia Dortmund. 5: The highest position Leicester City finished whilst at Filbert Street came in 1929 when they finished as runners up in the old first division - just a point behind eventual champions Sheffield Wednesday. 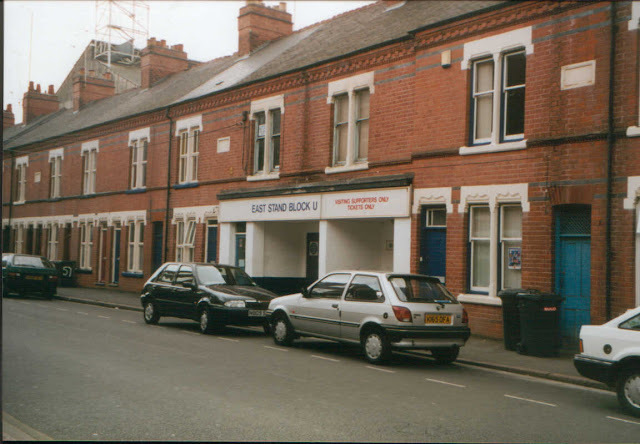 6: Meanwhile, the lowest league finish at Filbert Street came in 1991 with the club finishing 22nd in the old 2nd Divison - only avoiding relegation due to the temporary expansion of the 1st Division to 22 teams. 7: Leicester City have been losing FA Cup finalists on four occasions - losing to Wolves in 1949, Spurs in 1961, Manchester United in 1963 and Manchester City in 1969. They hold the unwanted record of reaching the most finals without winning the Trophy. 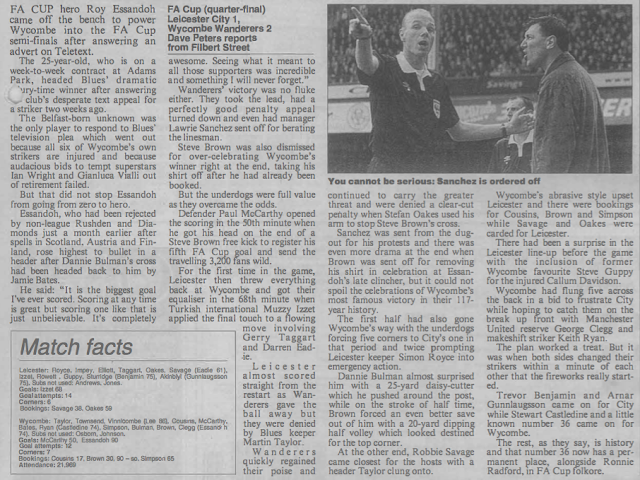 8: The Foxes have won the League cup on 3 occasions - beating Stoke City in 1964, Middlesbrough in 1997 and Tranmere in 2000. 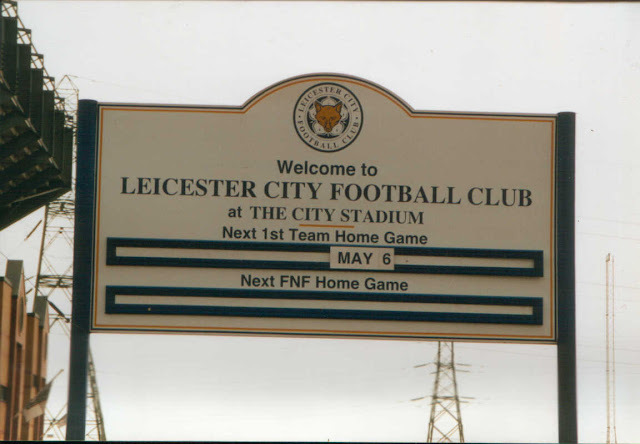 9: Leicester City have participated in 3 European campaigns with the sole victory coming in 1962 when they beat Northern Irish side Glenavon 7-2 on aggregate before they went on to lose to Atletico Madrid over 2 legs. 10: The last ever game to be played at Filbert Street was a 2-1 victory over Tottenham Hotspur in 2002. Matt Piper having the honour of scoring the last ever Leicester City goal at the ground. 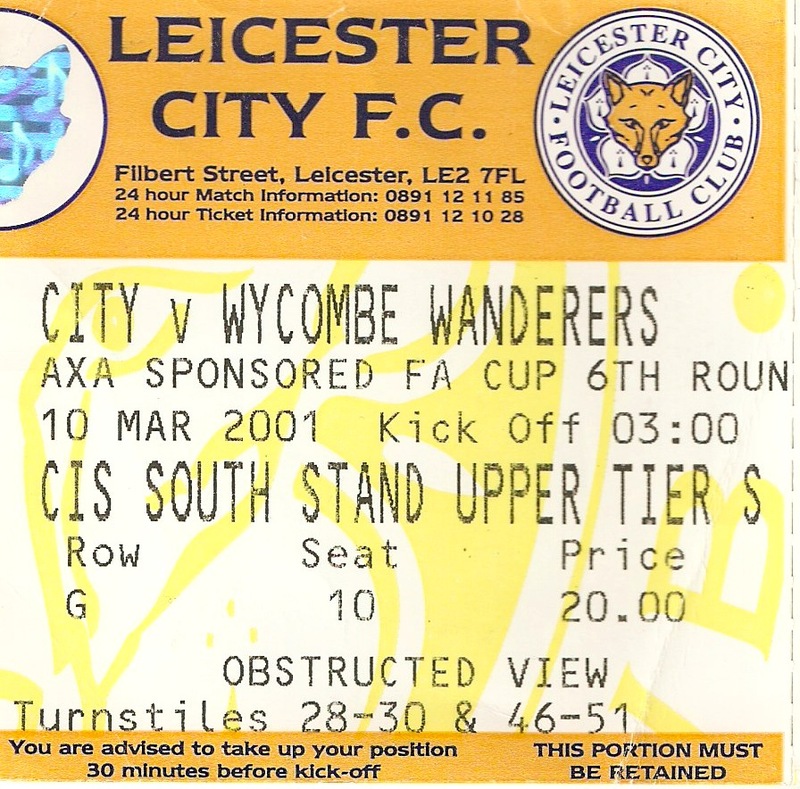 My only visit to Leicester City's Filbert Street stadium came in March 2001 towards the end of Wycombe's amazing FA Cup run to the semi-final. 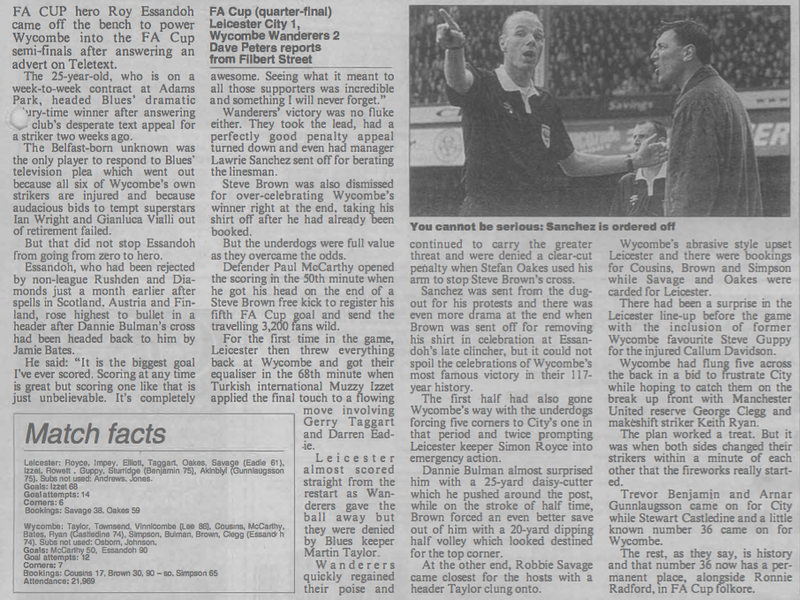 Although the game against Wimbledon was the most exciting, this win over Leicester, with a famous goal from Teletext signing Roy Essandoh is the one that will live long in the nation's memories. 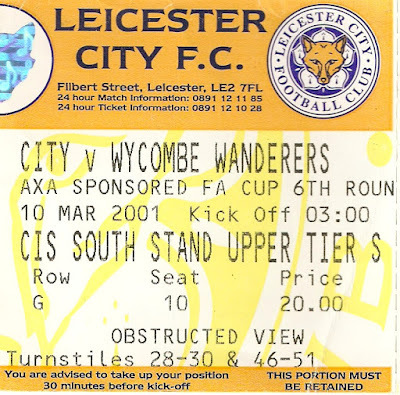 Wycombe were struggling in the third tier at the time whilst Leicester were going strong - sitting 6th in the Premiership and having just beaten Liverpool 2-0 the previous week. Wycombe meanwhile were so short of strikers that they put out an appeal online to find someone who wasn't cup tied. Enter one Roy Essandoh, an Irish-Ghanaian whose last club was in the footballing hotbed that was Finland. His agent spotted a story on Teletext and hooked him up with the club. He'd played in the previous weeks 1-0 home defeat to Port Vale and was pretty anonymous, but he was to become an unlikely hero. I went to that match with my Dad and my brother. My Dad drove and we had a pretty event free journey. When we got to the ground, there didn't look much in the way of pubs so I just got a kebab, a programme and the local paper. There was a great following from Wycombe, as would be expected for one of the most important games in their history. I had been very lucky to get a ticket, luckily I had one of the last few that were left. The view was not brilliant though, with me not being able to see the near goal due to the upper tier overhanging part of the pitch. Sill, at least I was at the game. Wycombe showed they meant business with Steve Brown aggressively but fairly tackling Robbie Savage straight from kick off. It was a fairly even first half though, with both sides having half chances but nothing of substance. The second half started with Wycombe having the upper hand and they took the lead on 50 minutes as Paul McCarthy headed in Steve Brown's free-kick. 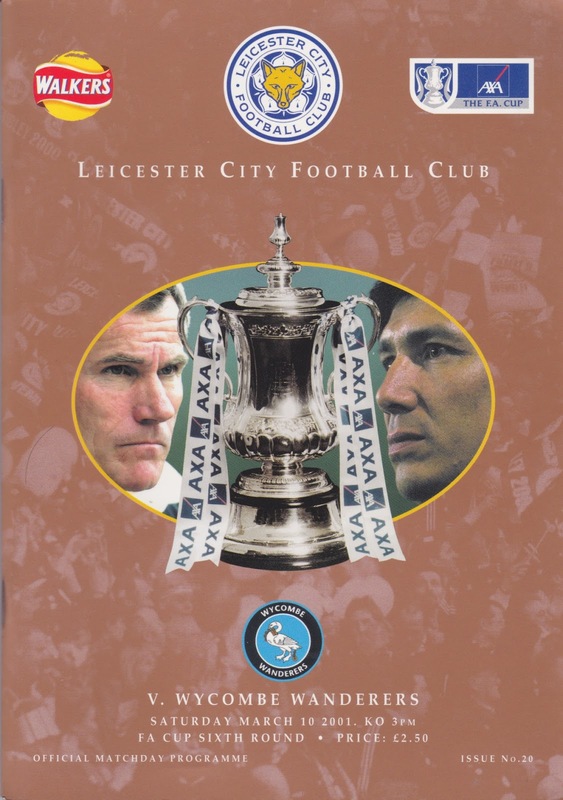 Leicester pressed but Wycombe generally soaked up the pressure well. That was, until the 68th minute when a cross was not cut out and Muzzy Izzett profited. There was a big moment of controversy minutes later when future Wycombe player Stefan Oakes blatantly handballed after a Steve Brown cross was put in the area. Somehow the referee and linesman contrived to miss it and a rightly furious Sanchez was sent off for his protests and had to watch the game from the dressing room. It looked as if it was going to a replay, but a Paul McCarthy header across the 6-yard box found Essandoh who gleefully headed home his only goal that season. It resulted in delirious celebrations from players and fans alike. Steve Brown removed a shirt to pay tribute to his seriously ill son Maxwell which prompted the referee to issue him with his second yellow card and therefore a sending off. Wycombe clung on though for a famous victory and certainly my most memorable moment supporting them. After the game we had another trouble free journey home. I went straight out on the town afterwards, remember drinking a lot, then ending up on my mate's shoulders in the Litten Tree in High Wycombe, singing Wycombe songs. I also have a vague memory of the pub having a ceiling that I'd forgotten about and soft tiles falling down. The next thing I was on the shoulders of a bouncer and being thrown out. I got a kebab and a taxi home, and as is usually the case for me, felt perfectly OK the following morning. 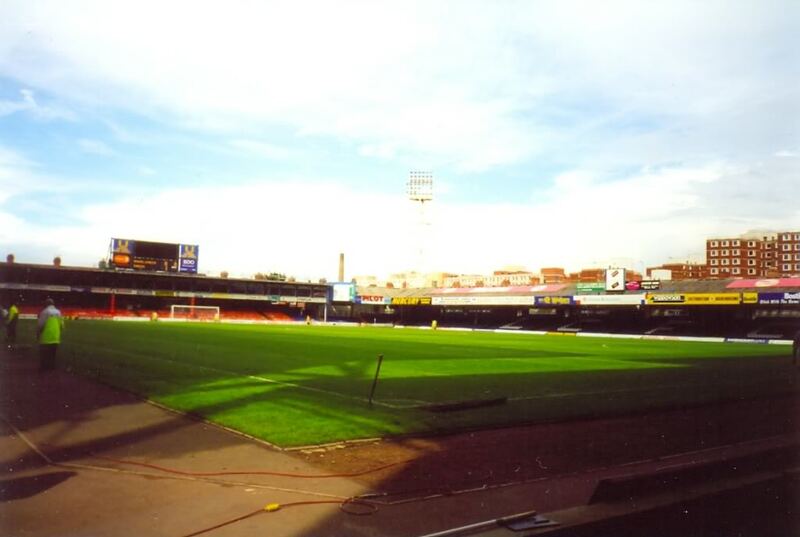 FILBERT STREET was Leicester's old stadium before they moved to their present home at the Walkers Stadium. 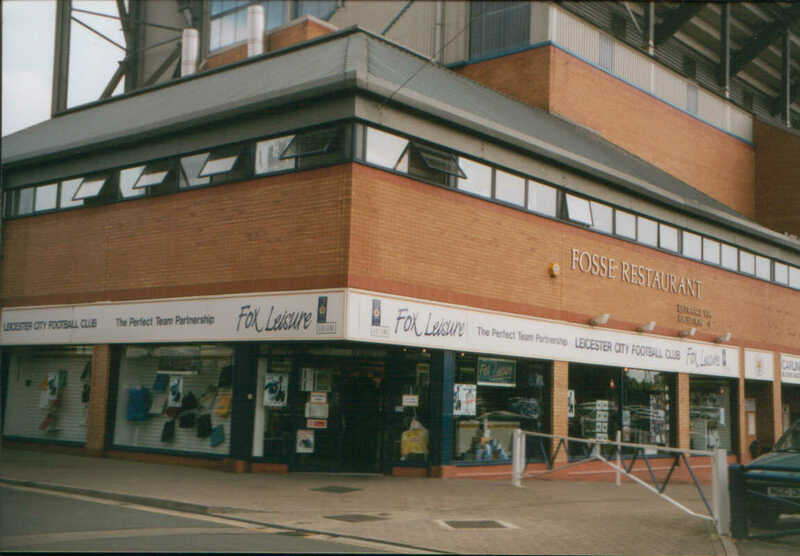 It was in walking distance of the current ground and also near the city centre, so you were well-served pre-match. There was also a fair amount of places within the vicinity of the ground in terms of takeaways and shops. One interesting thing was that a lot of the roads around the ground were named after types of nuts. The most modern of the stands was the Carling Stand. 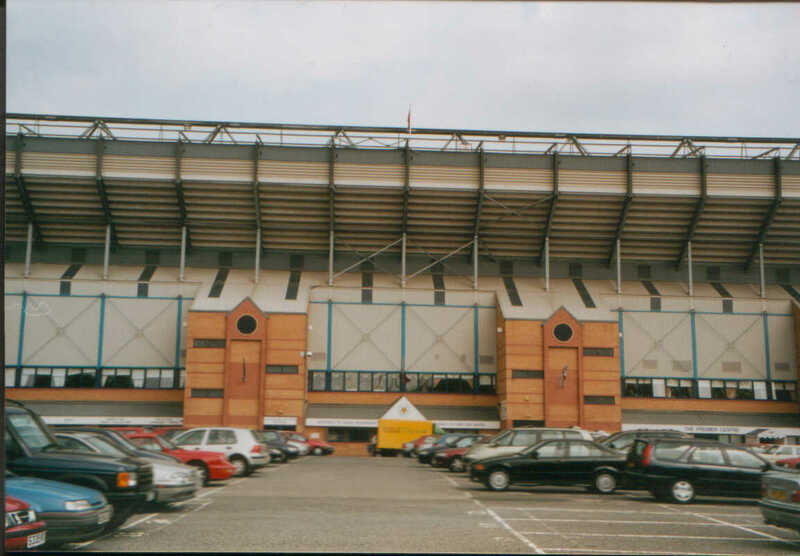 This was built in 1992 to comply with the Taylor report and was a smart 2 tiered structure with a row of executive boxes in the middle. This picture was obtained from somewhere off the net as I didn't take my camera on the day and was unable to get in on the passing visit I made a few years later. This applies for all of the below photos. There were a couple of older stands - the North Stand and the East stand that were mainly given to home supporters though some of the latter was allocated to away supporters on my visit to comply with cup ticket allocation rules. They were 2 older type stands with the North having a scoreboard and executive boxes above it. 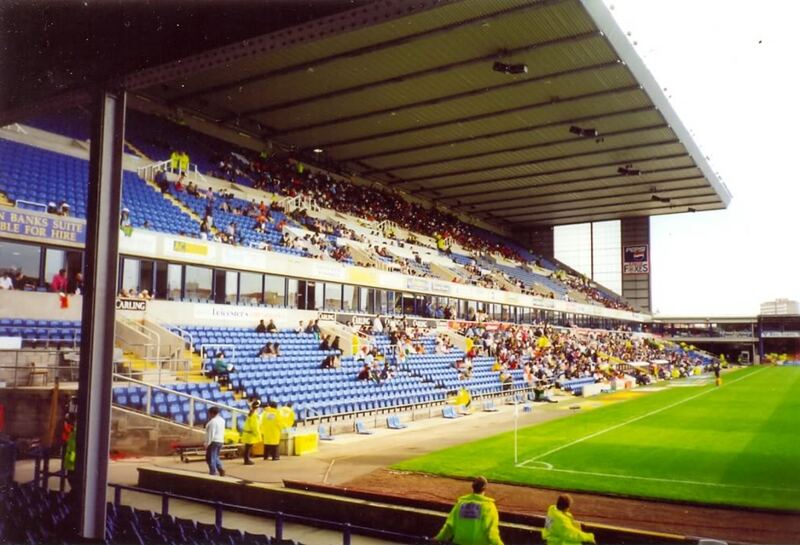 Finally, the South Stand was given to the away fans and was a 2 tiered structure. 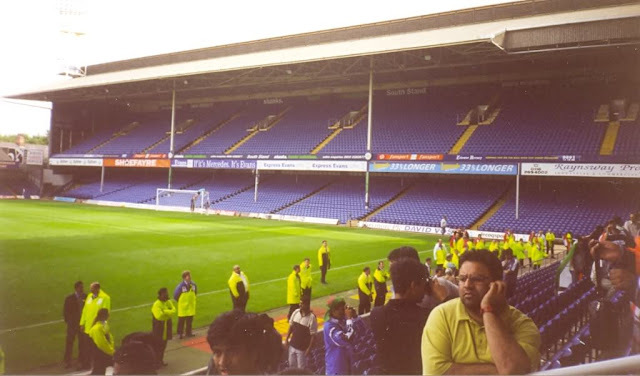 Like much of the ground it was dated and if you were unlucky enough to be seated in certain rows you weren't able to see the near goal due to poor design of the structure.